gorgeous, gorgeous day once again. this evening: laundry and packing, and then likely more reading. there's so many good ideas and great quotes - i can't put it down! What a cute pic! I should read In Her Shoes too. haha.. the reading scenario sounds very familiar to me. laundry is high on my list too although I wish reading was instead. 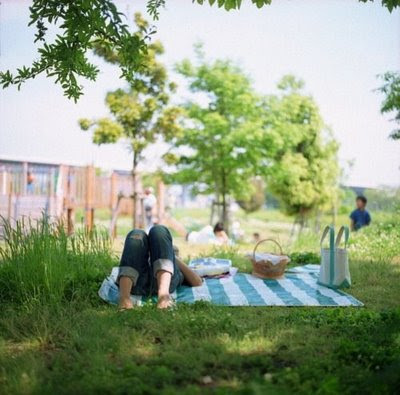 oh i love picnics and sitting on the grass! ps. i don't have any strawberry recipes, i only know how to make them into smoothies and shakes. it seems like alot of wes anderson's movies develop cult like followings :D hope you're having a great night! I know how you feel. I always am reading 2 or 3 books at a time but of course not at the same time. hello! I feel like I haven' said hi in a while. I apologize. Love the photo! Oh yes need to do laundry! Great day here too...wish I was outside! I *love* this photo! This is how I wish I could spend all of my days! Thanks for the breath of fresh air!